Novelty tin of breath mints. 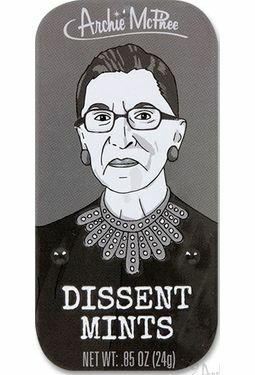 Supreme Court Justice Ruth Bader Ginsburg has a special collar she wears when she is dissenting from a majority opinion. These mints celebrate that collar! Each 3-1/8" x 1-1/2" x 1/2" (7.9 cm x 3.8 cm x 1.3 cm) tin contains .85 oz. (24 g) of mints.